Sorsogon Province (15 September) -- The backyard enterprise in the coastal barangay of Poropandan in Matnog, province of Sorsogon has grown by leaps. It has become one of the leading handicraft exporters of the province and the company's impact to the community and the local economy has been reaping for Analobel Enterprises awards and recognitions from various institutions. 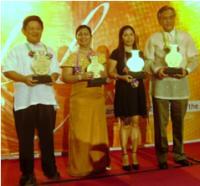 During the "Halyao Award" for Outstanding Bicolano Businessperson of the Year (Manufacturing Sector) given by the Metro Naga Chamber of Commerce and Industry (MNCCI) in partnership with the City Government of Naga and the Provincial Government of Camarines Sur, Ana G. Gotladera, the proprietor of Analobel Enterprises, proudly received the award. Ms. Ana Gotladera (second from right) poses with the other Bicolano Halyao Awardees for 2010. The event was held on July 3, 2010 at the Villa Caceres Hotel in Naga City. Halyao, is the pre-hispanic word for merchant, it is presented to entrepreneurs who are Bicolano by birth or by affinity, who maintain Management Excellence over a sustained period of time (not shorter than 5 years), resulting to successful enterprise within the region and in the Philippines and that it manifest deliberate and sustainable practices of corporate social responsibility. It can also be noted that during the OTOP (One Town One Product) National Congress held at the PTTC in Pasay City on March 12, 2010 the company was named as an ENVIRONMENT-FRIENDLY OTOP MSME. The citation is an acknowledgement of the company's active effort in utilizing local resources and indigenous materials in creating livelihood among the people. As an entrepreneur and advocate of environment-friendly and biodegradable products, Ms. Gotladera, has committed to produce bayong (bags) and packaging materials that help preserve and conserve our environment. "Bayong" has been identified as a good alternative packaging for plastics. Analobel was also the recipient of 2009's OUTSTANDING OTOP MSME during the 2nd Provincial OTOP Congress in Sorsogon, held on October 2009. The enterprise brought significant impact to the community, starting as organic soap producer in 2002, the company expanded to handicraft the following year to earn better income as well as provide employment opportunities to the marginal folks of Matnog and its neighboring municipalities. Utilizing the available raw materials in the area and armed with her innate talent in designing, Ms. Gotladera made the company's handicraft business very promising. The number of workers/subcontractors soared from 5 to its present 620. The product lines now include: bags, placemats, hampers, packaging bags and boxes, novelty items and decorative products. Its market also spread extensively within and outside the country. It found a niche in the USA for the packaging bags and boxes, home decors and accessories made from "sinamay" (woven abaca fiber) and buri.